Saturn Outlook Online Community > Vendors > CARiD.com > Discounts on Heininger Hitch Bike Racks at CARiD - Up to 15% Off! Discounts on Heininger Hitch Bike Racks at CARiD - Up to 15% Off! For all adventure seekers, CARiD offers a gorgeous cargo carrying setup from Heininger at a heavily reduced price. 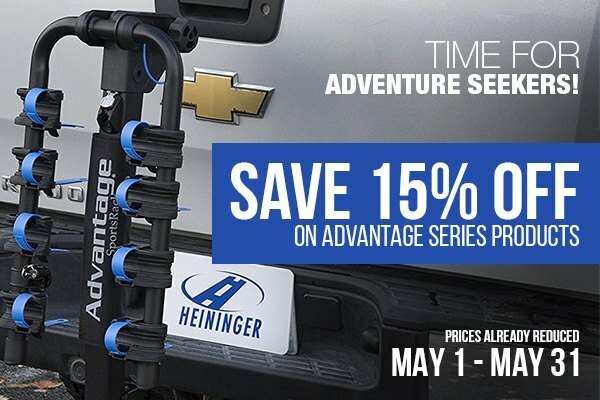 Purchase any Advantage series products and save up to 15% Off. The company has developed a wide variety of top-notch bike and roof racks, soft tops, trailer hitches and hitch extensions to fit any budget and any ride. No matter if you're taking a long route or just get out for a short trip, Heininger at CARiD will provide you with everything required to make your ride smooth and safe. Transport your belongings with confidence! The prices are already reduced.